Kim Wells: What is this? Edward Wells: It's a pentagram! Sign of the Devil! Oh my God! The worst movies can typically be divided into two distinct categories. The first category contains films that are so absurd that they end up seeming great for all the wrong reasons. Being able to revel in a film's silliness can make it worthwhile, even if its technical merits scrape the bottom of the barrel. The second category contains films that are so atrocious that they generate unnecessary anger rather than unintentional laughter. Films like these get me so worked up that I often come close to throwing my remote control through the television set. Acceptable Risk undoubtedly belongs in this second category. Chad Lowe plays Dr. Edward Wells, who finds a mysterious mold growing in his newly inherited 18th-century mansion. After analyzing it in his lab, he finds that the mold might be able to reverse the degenerative effects of brain disorders. Not feeling content with simply testing the fungus on lab rats, he begins ingesting the spores himself. Within no time at all, he experiences a significant increase of activity in his cerebral cortex. I shudder to think what his I.Q. must have been prior to gulping down the mold, since he is oblivious to the fact that the side effects have turned him into a raving lunatic. If this sounds absolutely ludicrous, bear in mind that I am being quite lenient by only disclosing the basics. The bottom line is, everything about this film is an utter fiasco. The directing is sloppy and uninspired. The screenplay is overflowing with dialogue that sounds as if it were written by an amateur. The film is billed as a thriller, yet it is so drab that it is difficult to classify it into any genre other than "dud." Every attempt to generate any kind of emotional response from the viewer fails miserably. Perhaps the filmmakers should have ingested Dr. Wells' mind-altering mold as an effort to create an intelligent piece of work. I truly feel sorry for Chad Lowe. Shortly after his wife won an Oscar� for her riveting performance in Boys Don't Cry and his brother basked in newfound success on television's The West Wing, he drew this lot. 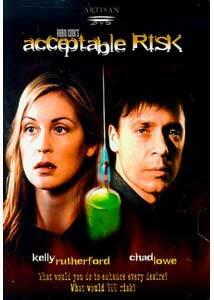 After watching Acceptable Risk, I now know the true reason for Chad's tears at the 2000 Academy Awards. My sympathy for him does not mean I will give him undue credit for his performace as Dr. Wells, but I will say that he is in good company. Every performance in within is no better than one I might witness at a local high school production. Although I mentioned earlier that there is no unintentional humor, that is not altogether true. There is a humorous moment where Kelly Rutherford wrestles with a psychotic kitty. The scene where Lowe stumbles upon the skeletal remains of a woman buried in his front yard is a riot. My heartiest laugh came from one of Edward's mold-induced spasms that caused him to gulf down chicken like a speed freak at Medieval Times. All of these backfired attempts to create suspense may have made me chuckle, but they are too few and far between to warrant a recommendation, even as an exercise in mockery. Good movies most often provide a thought-provoking, interactive experience for the viewer. In this case, I would have used more brainpower had I been sleeping. Image Transfer Review: The 1.33:1 image transfer is quite good for a made-for-television film, which is not to say that it does not have its share of trouble. The major problems appear during scenes of extreme darkness, which exhibit poor contrast, resulting in muddy shadow delineation and a dirty haze. The print is always grainy, yet not in a soothing film-like way. Colors appear subdued throughout, which does not appear to be intentional. Fortunately, compression artifacts are kept to a minimum. The picture is far from a winner, but it is visually acceptable. Audio Transfer Review: The 2.0 stereo surround track is incredibly restrained. Even at heightened volumes, the dialogue sounds muffled and, at times, unintelligible. The mix is unquestionably stereo, yet it does not project an expansive or wide presence, even with the musical score. The resulting audio experience sounds as if it is stuck in limbo somewhere between mono and stereo. Occasionally, the music and sound effects blend into the surrounds, but most of these instances will go by unnoticed at a distance of more than six inches from the speakers. The stereo soundtrack is average for a made-for-television film, but sonically disappointing nonetheless. Extras Review: There are merely two selections on the main menu screen, "Play Movie" and "Scene Selections." No subtitles are offered, but closed-captioning is available for those whose televisions support it. While I still consider this stripped-to-the-bone approach a failure, I must praise the decision to forego the special features in this case. If one were laid out with the flu, I could almost understand, if not condone, watching Acceptable Risk when it aired on TBS. Purchasing this film is an unacceptable risk, no matter what the price tag.